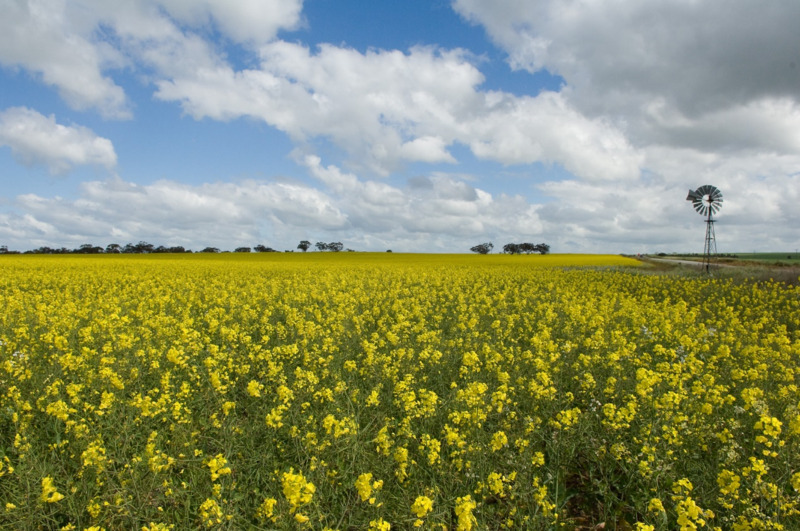 This page summarises the main factors to consider when planning or managing a canola crop. Ensuring the basics of canola agronomy are followed can minimise the financial risk of growing canola which can be higher than other crops due to high input costs, particularly the seed and fertiliser. Consider the likely weed burden in the paddock and the in-crop options available to control these weeds. Variety choice with canola is complicated by the availability of five different herbicide tolerance systems (see weed control section, below), and two different canola breeding types (open pollinated and hybrid). Each type has a different fit within farming systems. The Canola variety guide for Western Australia contains the latest information about canola varieties based on data from the National Variety Trial scheme. Early sowing is the key to maximising canola yield in Western Australia. Maximum canola yields are achieved with April sowing in low and medium rainfall zones and with April and May sowing in high rainfall zones. Some level of frost risk is unavoidable to achieve maximum yields, depending on location. If sowing opportunity is late, you can assess the risk of not achieving an acceptable yield by referring to Canola sowing time to maximise yield and Canola yield penalty with delayed sowing. A high proportion of canola crops are dry seeded due to the yield impact of delayed seeding and the availability of effective post emergence herbicide options (depending on canola type). If furrow fill occurs following dry seeding, plant emergence and plant density can be reduced as a result of plants being unable to emerge from too deep. Unless there has been an early break to the season, delaying seeding is likely to result in a yield penalty. The links embedded in the sowing window section (above) can be used to estimate the size of the yield penalty caused by delayed sowing. Lowering seeding rates can reduce costs, however it is critical that target plant densities are achieved. With a move to earlier sowing to improve yield potential it is becoming more common for canola crops to be sown into challenging conditions, often with warm temperatures and drying soil. In four trials conducted in low rainfall areas during 2016, trying to chase deep soil moisture did not work. Even though conditions at seeding in mid-April were hot and drying, the 1cm treatments established and yielded better than deeper sowing depths. There was an advantage using hybrid canola when sowing deeper than 1cm. In these trials, better establishment was obtained by using large seed and the hybrid varieties established better than open pollinated varieties in difficult conditions. In the situation where crop establishment is compromised, consideration should be given to the relative merits of reseeding versus not reseeding. The plasticity of canola has meant that yields above 1.0t/ha are possible from less than 10 plants/m2 in the northern regions when sown in mid-April. Failure to optimise fertiliser rates can diminish the gross margin of a canola crop through excessive input costs (too much fertiliser) or reduced yields (not enough fertiliser). Canola has slightly different nutritional requirements to other crops and a tailored fertiliser program can be developed using some of the many tools available for this purpose. These include software packages, mobile and online apps, information products and professional services. Develop the nitrogen strategy by considering the crops potential yield, soil test results and other rotational, soil type and rainfall information. Nitrogen is generally applied in split applications, allowing post emergence rates to be determined once yield potential can be more accurately estimated. Check soil phosphorus status, as maintenance rates at seeding may be all that is required. Canola has a higher requirement for sulfur than wheat. Canola is no more susceptible to micronutrient deficiencies than wheat. Monitor the crop within the season and tissue test to identify deficiencies to micronutrients. Regular soil and tissue testing is fundamental to tailoring fertiliser programs to crop demand. The Critical nutrient levels for canola in Western Australia can help canola growers interpret their soil and tissue test results. There are several herbicide tolerance systems available in WA canola varieties (see below). Considerations for choosing a system include the weed spectrum and resistance status of weeds, crop sequence, rainfall zone as well as cost. Numerous insect species can infest canola crops but the application of a chemical insecticide is not always necessary. It is important to monitor crops through the season to allow time to respond to potentially damaging infestations. Canola - insect threshold levels lists the insects commonly found in canola crops, as well as information to help determine the threshold population level, above which spraying of insecticide may be worthwhile. Infestations of turnip aphids, cabbage aphids and green peach aphids can all reach damaging levels in canola crops in WA. Aphid management in canola crops and Diagnosing canola aphids has detailed information about aphid management. It is important to actively monitor canola crops for disease through the growing season to allow time to consider and implement management options. Fungicides can be used to complement other management strategies but can not be relied on alone. Options include dressing of seed, treatment of fertiliser and foliar fungicides. All commercially sold seed comes with a fungicide seed dressing, however if retained seed is being sown it is important to ensure a fungicide seed dressing is applied. Appropriate rotation. Grow canola in rotation with other crop species and do not grow successive canola crops in the same paddock. Variety selection. Chose a variety with sufficient blackleg resistance for your region. Canola blackleg spore maturity forecast for Western Australia can help determine the blackleg risk in each region based on seasonal rainfall to date. A mobile app, Blackleg CM is available from GooglePlay and App Store. For more information, refer to: Diagnosing blackleg in canola. Sclerotinia stem rot is a fungal disease of canola. Disease development can be unpredictable because seasonal conditions plays a major role with rainy conditions during flowering on the main stem a major contributing factor. Rotation, tillage and fungicides are currently the best strategies for managing sclerotinia stem rot in canola. For more information, refer to Managing sclerotinia stem rot in canola and Diagnosing sclerotinia in canola. A number of other fungal and viral diseases can occur in canola crops. These include powdery mildew, downy mildew, white leaf spot, alternaria black spot, clubroot, turnip mosaic virus, cauliflower mosaic virus and beet western yellow virus. Direct harvesting and swathing (windrowing) are both widely used techniques for harvesting canola crops. Swathing ensures all pods are mature at harvest and, done correctly can minimise harvest losses due to pod shatter. Swathing is generally done when the seeds are at 40-60% colour change and a herbicide is usually applied under the cutter to control surviving weeds. Direct harvesting is becoming more common with the availability of low shatter canola varieties, particularly in low and medium rainfall areas. A chemical dessicant is generally applied prior to harvest to reduce moisture content and control any surviving weeds. Direct harvest variety comparison 2015 trial report. The Tactical Break Crop Agronomy Project supported by the Grains Research and Development Corporation supported has been investigating canola agronomy since 2014 with project details and research trial information.